http://karinlibrarian.booklikes.com Karin's Book Nook 3.0 The Pigeon Wants a Puppy! text The Pigeon Wants a Puppy! 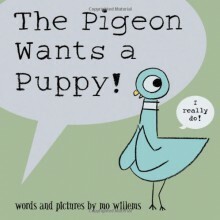 http://shawnweisser.booklikes.com Read With Me 4.0 The Pigeon Wants a Puppy! This was another Mo Willems book that my niece and nephew laughed about. Very cute, funny story.